A new simulation of Pluto's upper atmosphere shows that it extends so far from the planet that stray molecules may be deposited on its largest moon, Charon. The new model predicts that Pluto's atmosphere can extend as far as 6,456 miles (10,390 kilometers) into space, or about 4.5 times the diameter of Pluto. That's more than halfway to Charon. "That is amazing, from my perspective," said Justin Erwin, the lead author of the paper and a Ph.D. student at the University of Virginia. Researchers combined two previously known models of Pluto's atmosphere to better estimate the escape rate of molecules into space. Their refinement made a big difference. "Our [calculated escape rate] is a little bit smaller, but the small change in the escape rate causes a large change in the structure of the atmosphere," Erwin added. Erwin's supervisor at the University of Virginia, Robert Johnson, was a co-author of the paper reporting the findings, which was published on the preprint site Arxiv and has been submitted to the journal Icarus for publication. Pluto's tenuous atmosphere is mainly composed of methane, nitrogen and poisonous carbon monoxide that likely comes from ice on the dwarf planet's surface. The size of the atmosphere changes as Pluto moves closer and farther from the sun in its elliptical orbit. When Pluto swings near the sun, the sun's heat evaporates the ice and gases slowly escape into space. This process continues until Pluto moves away and the sun's heat fades. Then, the ice builds up until Pluto approaches the sun again. Pluto's last close approach to the sun was in 1989. That is considered a fairly recent event, because it takes 248 years for the dwarf planet to orbit the sun once. It's difficult to figure out the size of Pluto's atmosphere because of a debate over how best to measure it. Pluto's atmosphere is heated by infrared and ultraviolet light from the sun. Closer to the planet, ultraviolet light is absorbed in the atmosphere and only infrared heating takes place. But farther away from the planet, the atmosphere is thin enough that the ultraviolet light affects the molecules. This is why researchers use ultraviolet heating models for the upper reaches of the atmosphere. Molecules that are escaping from Pluto's atmosphere move through a region called the thermosphere. The thermosphere is where much of the ultraviolet light is absorbed in the atmosphere; this heating drives the escape process. In the exosphere, at the top of Pluto's atmosphere, the atmosphere is so tenuous that collisions between particles do not happen as frequently. The boundary between the thermosphere and the exosphere is called the exobase. Researchers aren't sure where the "boundary" is. Because the mathematical model for each section of the atmosphere is different, this leads to vast uncertainties in calculating the size of Pluto's atmosphere. Last year, Erwin participated in an Icarus paper that demonstrated a new model to estimate the upper atmosphere's extent during the solar minimum (when Pluto receives the least heat from the sun). This time around, Erwin and his co-authors extended that model to include solar maximum — when Pluto is warmest — and solar medium, or average heating. Pluto is so far from Earth, and so small, that its size isn't precisely known. When forming their model, the researchers assumed that the diameter of Pluto is roughly 1,429 miles (2,300 kilometers). However, the accepted range for the diameter differs by as much as 62 miles (100 km). 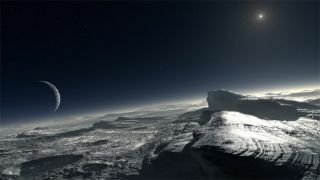 The New Horizons team plans to better measure the size of Pluto and its atmosphere when the spacecraft swings by Pluto in 2015.